The full release version of Opera 10 has arrived, bringing with it Opera Turbo, a sleek new interface and tabs. The popular browser has been tested extensively over the last few months, and has now been given the okay for a full release. Opera 10 brings with it Opera Turbo – which compresses pages to make surfing on a bad connection much quicker – a key addition in the age of 3G cards and commuting computing. 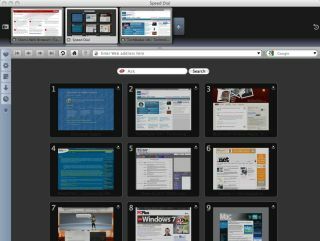 The second key change is a whole new interface, which helps to show off the third major change – tabbed browsing, with full thumbnails of open tabs. "At Opera, we have always worked hard to innovate new ways to improve everyone's browsing experience," said Jon von Tetzchner, CEO, Opera. "Opera Turbo is our newest innovation, and one we think everyone should try, because we all will face a slow connection at some point. Now, there is a solution, and it is absolutely free. "We are excited to offer Opera 10 to the world, and we hope even more people discover what the 40 million people who have already made the switch know: browsing with Opera makes the Web a safer, more enjoyable and more interesting place."